How It Works: Felisept Home Comfort Set contains an electric aroma diffuser and the associated bottle. 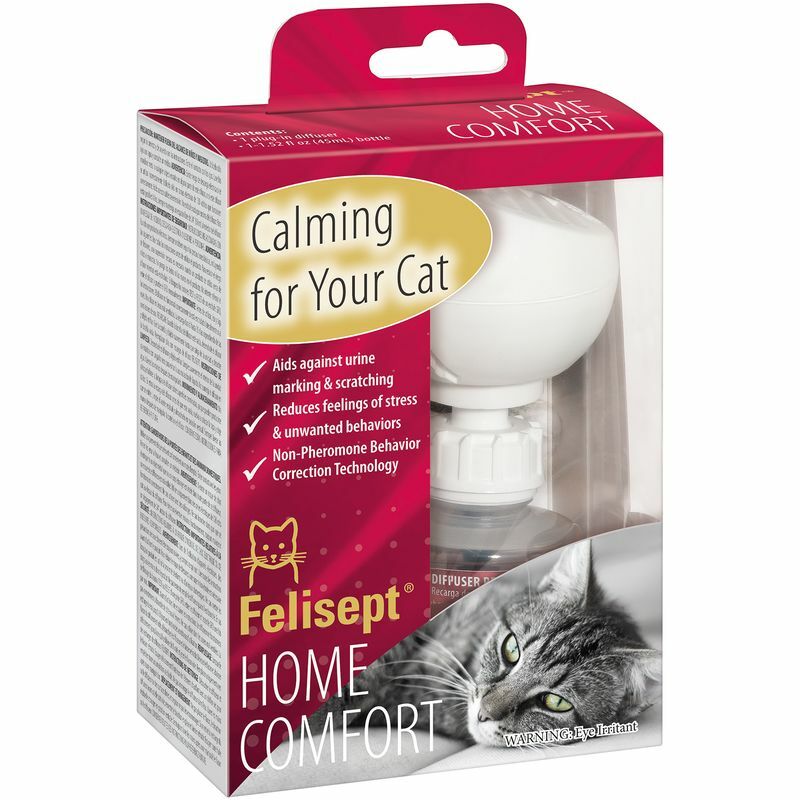 The fragrance contained creates a relaxed, feel-good atmosphere for your cat and helps in a natural way to calm and reduce stress and anxiety. 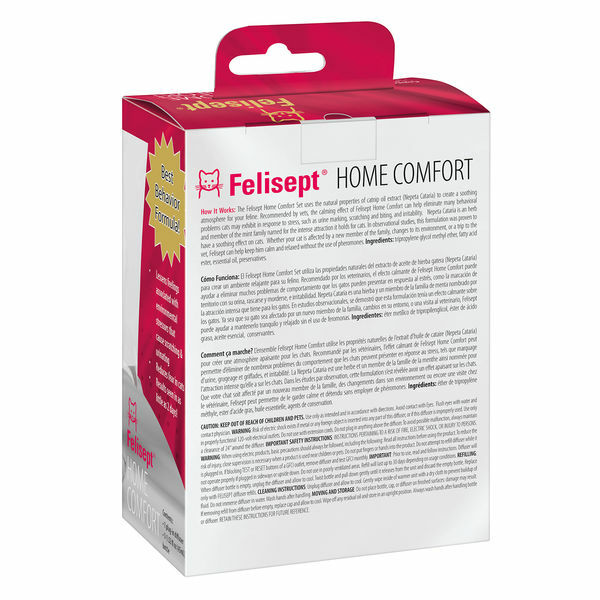 Felisept Home Comfort helps to control unwanted behavior (such as urine marking, hypersensitivity or irritability). The active substance in Felisept is an extract of Catnip (Nepeta cataria L.) - a plant of the Lamiaceae family, which also includes different species of mints. The plant is known under the name of “cats mint“ because of its particular attraction for cats and other feline species. This is due to a substance in the plant called nepetalactone. Nepetalactone plays the role of a social calm and therefore is particularly good in stressful situations related to social interactions or territoriality problems. 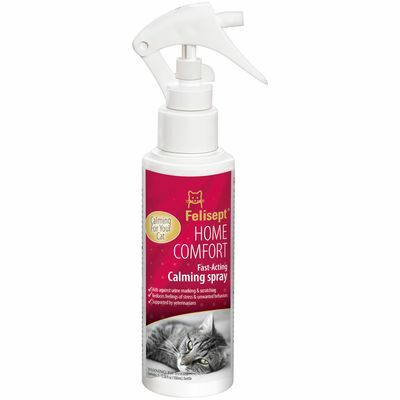 Veterinary clinical studies showed that the ingredients in Felisept Home Comfort have provided a decrease in the frequency of behaviors related to stress within a few days. More than that, these studies outlined that the calming effect of Nepetalactone itself increases and becomes even more pronounced when used for an extended period of time. Directions for use: Unscrew the child safety cap of the vial and screw into the electric diffuser. Plug the diffuser into a power outlet. The diffuser will start to be effective after approximately 1 hour and to be most effective should remain plugged in. Suitable for an area of approximately 500 sq. ft. for up to 30 days. 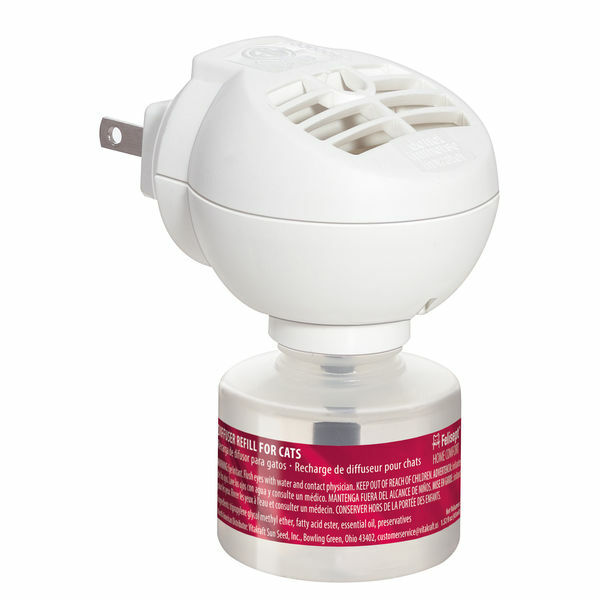 The diffuser can be used in households in the presence of humans and animals. After 30 days, or when the vial is empty, unplug the entire diffuser and replace vial with a Felisept refill. The calming aroma covers an area of approximately 500 square feet. Aroma is effective after 1 hour of being plugged in. Takes 2 days for cats exhibit a change in behavior. CAUTION: KEEP OUT OF REACH OF CHILDREN AND PETS. Use only as intended and in accordance with directions. WARNING: Risk of electric shock exists if metal or any foreign objects inserted into any part of this diffuser or if this diffuser is improperly used. Use only in properly functional 120-volt electrical outlet. Do not use with extension cords. Do not plug in anything above the diffuser. To avoid possible malfunction, always maintain a clearance of 24‘’ around the diffuser. IMPORTANT SAFETY INSTRUCTIONS: INSTRUCTIONS PERTAINING TO A RISK OF FIRE, ELECTRIC SHOCK OR INJURY TO PERSONS. WARNING: When using electric products, basic precautions should always be followed, including the following: read all the instructions before using the product. To reduce the risk of injury, close supervision is necessary when a product is used near children or pets. Do not put fingers or hands into the product. Do not attempt to refill diffuser while it is plugged in. If the diffuser blocks TEST or RESET buttons of a GFCI receptacle, the diffuser should be removed from the outlet monthly and the GFCI be tested before plugging the diffuser back into the outlet. IMPORTANT: Prior to use, read and follow instructions. Diffuser will not operate properly if plugged in sideways or upside down. Do not use in small poorly ventilated areas. Refill will last up to 30 days depending on usage conditions. REFILLING: When diffuser bottle is empty, unplug the diffuser and allow to cool. Twist bottle and pull down gently until it releases from the unit and discard the empty bottle. 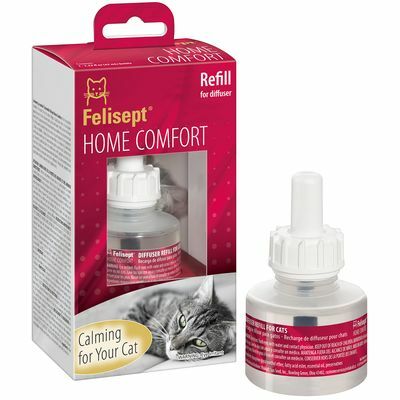 Replace by using only FELISEPT diffuser refills. CLEANING INSTRUCTIONS: Unplug diffuser and allow to cool. Gently wipe inside of warmer unit with a dry cloth to prevent buildup of fluid. Do not immerse diffuser in water. Wash hands after handling. MOVING AND STORAGE: Do not place bottle, cap or diffuser on finished surfaces, damage may result. If you remove refill from diffuser before empty, recap, allow to cool, wipe off any residual oil, and store in an upright position. Always wash hands after handling bottle or diffuser. RETAIN THESE INSTRUCTIONS FOR FUTURE REFERENCE. Essential oils, tripropylene glycol methyl ether, fatty acid ester, preservative, fragrance. How It Works: Felisept Home Comfort Set contains an electric aroma diffuser and the associated bottle. Fast-Acting Best Behavior Formula!! Cats are naturally solitary and territorial animals.